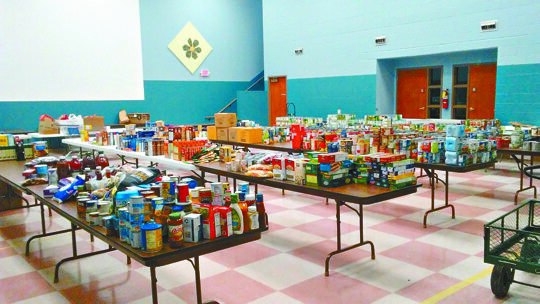 Graham Jaehnig/Daily Mining Gazette Just one of the many programs offered by the Salvation Army is its food bank, which helps low-income families and those with emergency needs. HANCOCK — Critical funding for the Salvation Army’s programs includes donations received throughout the year, as well as a direct mail campaign, Capt. Leonita Schweigert said, in addition to the annual Red Kettle campaign. Year-round funding supports many youth outreach programs, many of which aren’t offered elsewhere, particularly two new ones scheduled to begin this year. “We are in the final stages of planning for our Adventure Corps Cafe,” Schweigert said. “This program will bring in children from fourth grade to 12th grade. The program has several components, including planting, gardening, harvesting, food safety, cooking, nutrition, cost reduction and inventory control. This is only one of many programs scheduled to begin in 2018, she said. Another program soon to be offered is the Hancock Archery Club, which will teach archery and bow hunting to children grades four to 12. In order to offer this program, Schweigert herself needed to take classes and become certified in archery and bowhunting. In addition, the Salvation Army also has scholarships for many children to attend summer camps. While the Salvation Army is an evangelical part of the universal Christian Church, Schweigert said the organization serves anyone in need, regardless of religion, race, creed, or color.